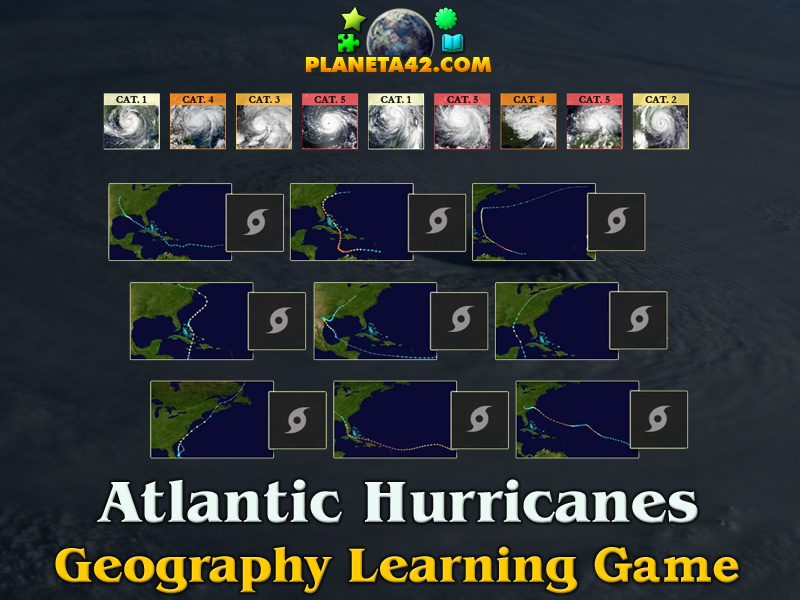 9 major Atlantic hurricanes in online geography learning game. 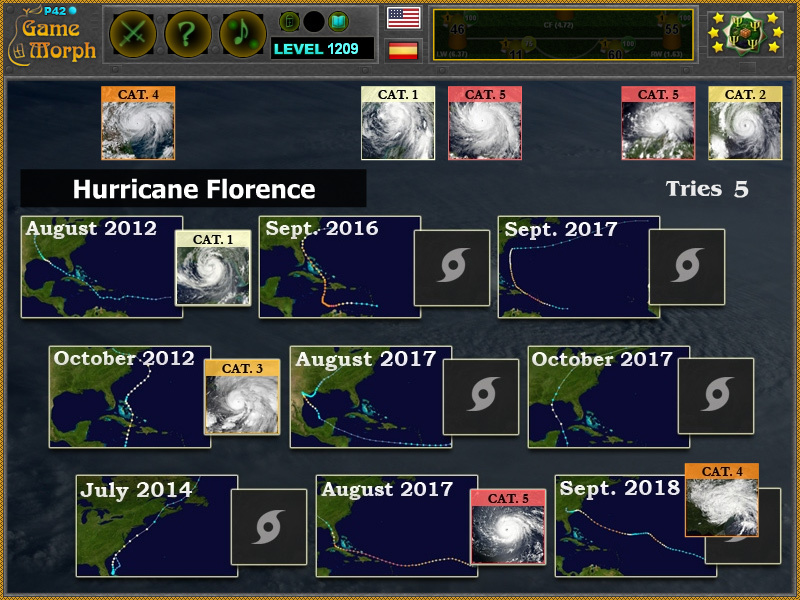 "Atlantic Hurricanes 2010 - 2018" is a free online knowledge level game to sort the hurricanes of 2010 - 2018 by year and category. It include names, path and SSHWS category of 9 major hurricanes that appear from 2010 to 2018. Free online game to explore and learn hurricanes properties. Geography mosaic game, suitable for online lessons and interactive classes. Minute to win it game. Pictures and info from Wikipedia, game code by Ogo Bob. How to play Atlantic Hurricanes 2010 - 2018. There are 9 movable pictures of hurricanes and their SSHWS category at the top the scren. Drag and drop them at the correct date and path at the center of the screen. Sort all 9 hurricanes to win the game. Know at least 3 major hurricanes and get +1 Knowledge Level. An Atlantic hurricane is a tropical cyclone that forms in the Atlantic Ocean, usually between the months of June and November. A hurricane differs from a cyclone or typhoon only on the basis of location. It is a storm that occurs in the Atlantic Ocean and northeastern Pacific Ocean, a typhoon occurs in the northwestern Pacific Ocean, and a cyclone occurs in the south Pacific or Indian Ocean. While the number of storms in the Atlantic has increased since 1995, there is no obvious global trend. The annual number of tropical cyclones worldwide remains about 87 ± 10. Which are the hurricanes of 2010 -2018? How many Category 5 hurricanes are there between 2010 - 2018? Which season do hurricanes appear in Atlantic Ocean? What is the SSHWS category of 2018 Florence hurricane?